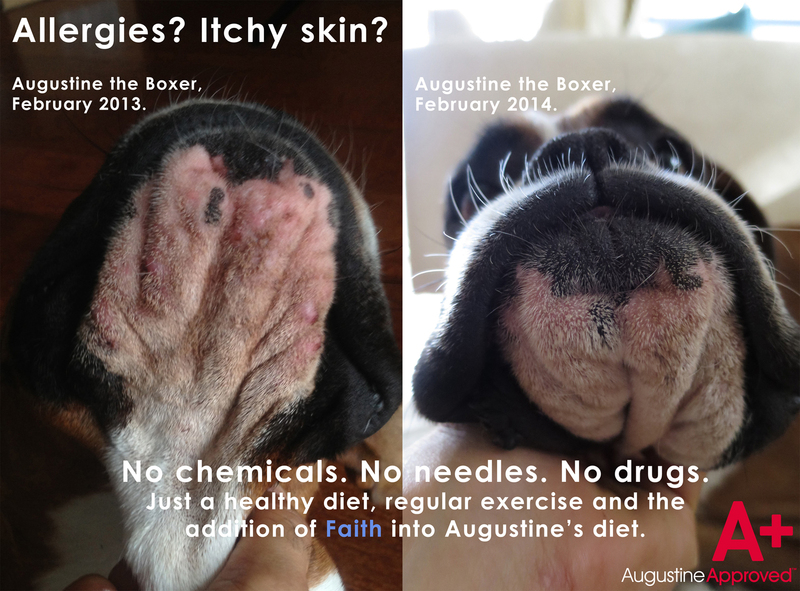 Add Augustine's SuperBoost to your dog's diet. 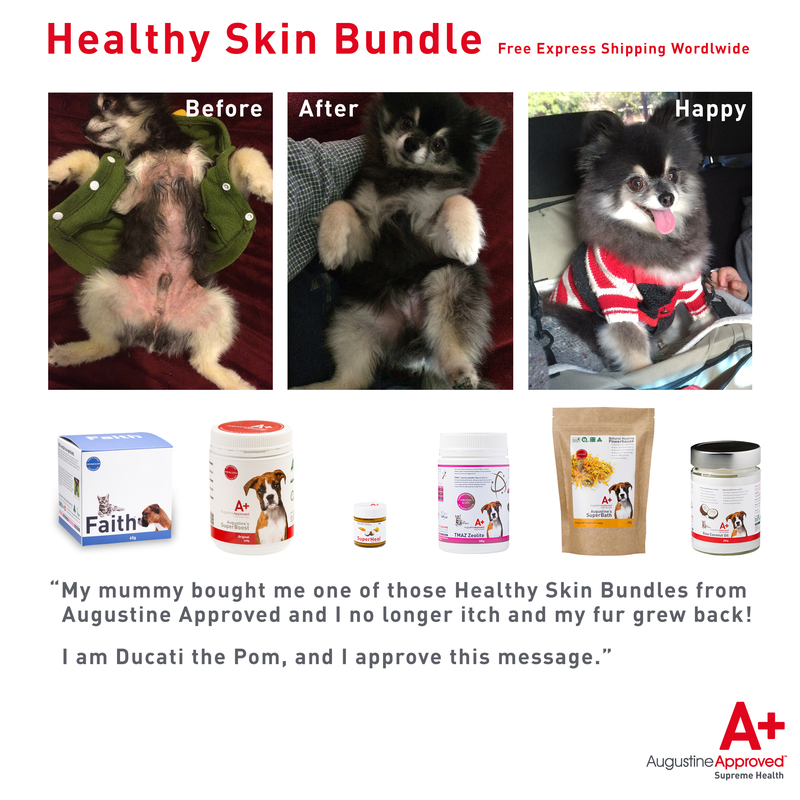 Healthy Skin Bundles contain some of our favourite canine products for those new to the Augustine Approved brand (click below to read about each product). This video explains candida as the primary cause of skin problems and details the Augustine Approved Healthy Skin Protocol. Please remember that for an improvement in skin problems, a good clean diet of unprocessed foods (including the removal of refined sugars) is highly recommended. 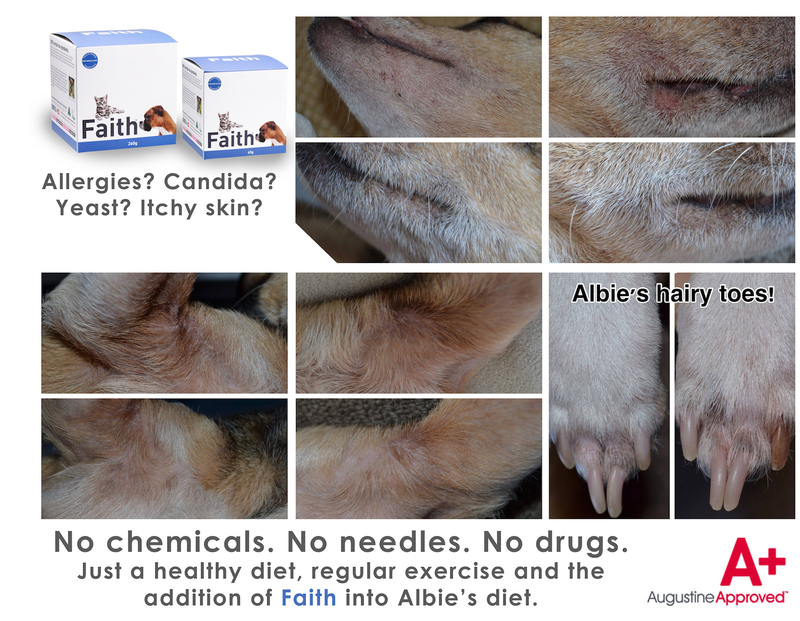 Treating candida is something I fell into out of desperation to treat my dogs, which then expanded into helping our canine customers, which in turn expanded into helping people with severe candida overgrowth as well with great results. It's important to ask that you research what Candida Albicans is. A yeast infection (more appropriately named a fungal infection) is a symptom of candida overgrowth. I won't say much more on that but I encourage you to ask your best friend Google. A sample report of the hair analysis discussed in the video is located in the images of this product. To organise a hair analysis please call Coburg Health on +61 03 9354 8007 for more information. I believe candida to be a leading cause of cancer, and it can even mimic cancer. Recently we saw a dog that had $12,000 of chemo etc. and was about to be put down because the vet said nothing was working. My colleague in NSW intervened after getting the hair analysis results back and the dog is still alive today. The dog never had cancer - it was candida. The dog is doing ok but now they are working to restore the dog's immune system after the vet destroyed it. We had another customer with a dog that was vomiting every day for over a year. The specialist even stitched the dog's stomach to its side to avoid bloat, even though he really didn't know what the problem was. About a week into our treatment the dog was 100% fine - it was just candida overgrowth affecting digestion. For more information please refer to the video for a detailed explanation of each product or view each individual product page by clicking the links above. There is information on how to put Faith's Cleanse & Detox into capsules for human use on the Faith's Cleanse & Detox store page. D-Mannose is also available for purchase at Coburg Health in Melbourne, Australia (Tel 03 9354 8007). What's the difference between the Original red label and the Vegan orange label bundle? The only difference is which version of Augustine's SuperBoost is in the bundle - Original or Vegan. The Vegan orange label is made for dogs that do not consume meat in their diet. In short, if your dog eats meat then you should be purchasing the original bundle. Hi Phivo, I hope you and your beautiful girls are going well. I would like to take this opportunity to thank you from the bottom of my heart for all that you have done to create all the Augustine Approved products that help create and maintain a wholistic state of wellbeing for our beloved four legged members of our families. My girl is my life and since using your products I have noticed a visable difference in her overall health. I cook your Augustine's SuperFood (vegan) recipe which includes Augustine's SuperBoost (vegan). My dog was so sick for three years, having severe meat allergies also including eggs, fish, coconut oil and nut allergies. I give her probiotics every day, along with Faith and Dynacol Zeolite. I am truly grateful from the bottom of my heart for you helping me give my girl the best gift of all and that is the gift of health! She is thriving and flourishing and I know in part it is because of you. Mere words could never express the amount of gratitude I have for what you have helped me to achieve with Holly. So...thankyou Phivo... You are my hero! Our 12 year old Lab started these goodies almost 4 weeks ago and I cannot believe the difference! Her overall energy levels have improved (she is reliving her youth) and her skin and coat is just so soft, smooth and shiny. She no longer looks like she has 'old dog' fur and people keep commenting on it (which she can't get enough of). I cannot recommend these products enough. Thank you Augustine Approved, what a gift you are to the universe!